Some progress in trade negotiations, but uncertainty will tend to persist. The recent statements following the bilateral meetings between the US and China suggest that important progress has been made, and more details are emerging compared to the quiet early January round. However the uncertainty surrounding the talks remains high, and if no deal is reached before March 1st, $200bn of Chinese imports will experience tariff increases from 10% to 25%. At the core of the discussion, there are structural issues, such as technology transfers and intellectual property protection. China continued to make positive gestures by taking action on some key areas: for example, by further opening its bond rating markets (S&P Global was approved to set up its first rating unit in Beijing). China is also accelerating passage of a proposed new Foreign Investment Law, which is planned to reduce barriers for foreign investors and to ban forced intellectual property transfer. On trade, arrangements have been made for new rounds of soybean purchases. 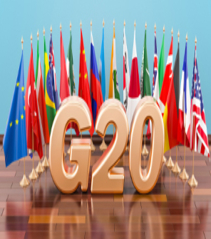 Uncertainty regarding the bilateral negotiations will remain high, however, as it is still difficult to see a complete and final agreement being reached in the short term. A more likely option looks to be some sort of conditional deal, with China making certain real concessions while the US could adopt some kind of mechanism to review China’s implementations going forward. The easing of trade disputes is one key to our scenario of China’s economy slowing, but with no hard landing. The easing of trade disputes is one key point to our scenario of a moderate slowdown for China, but with global growth not being derailed. In particular, China is in the middle of a comprehensive transition to a more balanced and sustainable economy, with policymakers fully engaged in a difficult and delicate balancing exercise of manoeuvring deleveraging, preventing a disruptive slowdown (6% represents a sort of threshold level for the market), correcting the misallocation of capital, and intervening with the right stimulus. The transition, of climbing the value chain and moving away from an investment- and export-led growth model to a focus on domestic sectors and consumption (though still very much in progress), if successful, should finally result in the economy becoming more resilient and less exposed to cyclical swings. Further climbing the value chain and the rebalancing of Chinese economy towards consumption could limit the deterioration due to the weak exports. On the economic front, data are mixed: there are areas of weakness, with possible distortions linked to the year-end, but overall, we don’t view an abrupt slowdown as likely. We forecast only a moderate slowdown: a GDP growth rate of 6.2% for 2019 and soft inflation (2%), but there are a number of challenges for the near term. 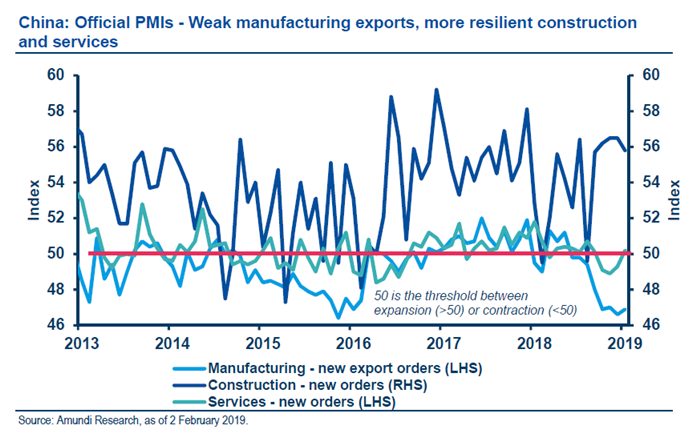 One of these is exports dynamics: the recent Purchasing Managers’ Index (PMI) new export orders figure signals further potential weakness of exports near term on the back of a slowing global economy and signs of previous front-loading unwinding linked to US tariffs. A second challenge is the auto sector, which contributed for a large part of the slowdowns in retail sales and industrial production in Q3 and Q4, but we would expect to see some stabilisation in coming months. Beyond auto and petrol, other parts of retail sales have been on a slowing trend, but not yet in a dramatic way, and consumer sentiment indicators are still holding up. Data are mixed for the property sector. 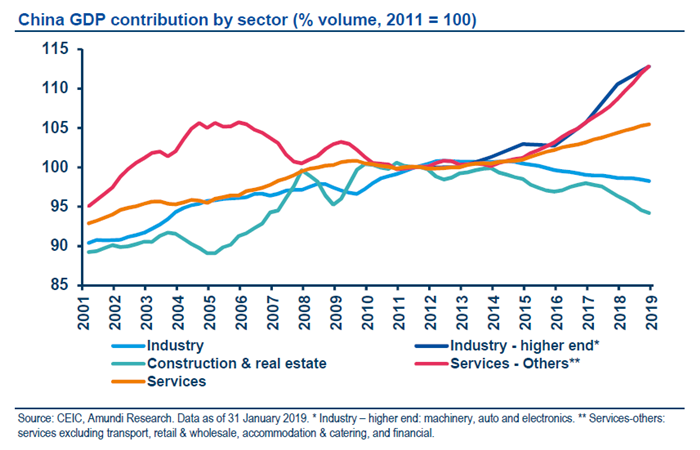 We expect to see a moderate slowdown for the sector as whole: pressures could be more concentrated in low-tier cities while tier 1 and 2 cities look to be more resilient, with inventories still low. On the positive side, China’s policymakers seem determined to use the cyclical policy supports to prevent an economic hard-landing. On monetary policy, there is a clear easing bias, with plenty of margin for further RRR (reserve requirement ratio) cuts. There are also increasing chances of benchmark bank rate cuts, although this is not yet in our central case. Additional tools, like the TMLF (Targeted Medium Term Lending Facility), have been introduced to support bank lending to small and private businesses. These efforts should help to ease funding constraints and reduce borrowing costs, offsetting weakness in credit demand. Additional policy measures expected in 2019 should help to stabilise economic growth at around 6%. On fiscal policy, there has been a turnaround of the fiscal deficit since Q3, with in particular a strong push regarding fiscal spending in December, although shadow financing by local government was partially addressed via previous deleveraging efforts. For 2019, we expect to see more supportive measures. During the Economic Work Conference in December, there was a strong emphasis on a "larger scale of tax cut and fee reduction" through the official budget. This seems to imply: 1) potential cuts of corporate VAT and income tax rates; 2) announced personal income tax cuts with certain deductions to become effective 3) further reductions in social security contributions; 4) further cuts to import tariffs. The additional public spending will be financed by local government special bond issuance. Our current guess is that fiscal deficits could grow by around 1% of GDP relative to 2018. Nonetheless, in our view, Chinese authorities are seeking a fine balance between preventing excessive economic cooling and managing the deleveraging of an over-indebted system, as policymakers are still concerned about the high leverage of the economy. Therefore, we believe that overall credit growth could bottom out in the near term and then slightly recover. Regarding non-performing loans (NPLs), NPL ratios have declined somewhat since 2016; we expect NPLs to stop falling, but not to pick up fast, as was the case in the 2014-15 period, as borrowing costs should stay contained due to the easing stance of the People’s Bank of China. Valuations for China are quite inexpensive and seem to discount a very negative scenario. After experiencing an erratic path, the Chinese market recorded one of the worst performances in equities in 2018 (MSCI China, -17.8%), largely due to trade war worries. Since the beginning of 2019, Chinese stock markets have recovered significantly based on tensions receding, and we still believe there is upside potential. 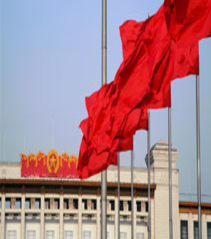 China is planning to accelerate fiscal and monetary stimulus (such as VAT cuts, consumption supportive measures, higher fiscal deficit target and special local government debt quota, possible cut in policy rates) and such measures could be particularly positive for the domestic economy as well as for all Asian area. Valuations for China are quite inexpensive and seem to discount a very negative scenario. After many months of negative earnings momentum, we saw some signs of bottoming in terms of revisions. The sentiment is positive and the recent more decisively dovish Fed (at the meeting of 30 January) offered some further support to all EM assets. Based on a tactical approach, 1H19 could provide good entry points for investors. In our view, the main drivers of the market currently are the currency evolution and developments in trade negotiations which in turn have an effect on the currency. 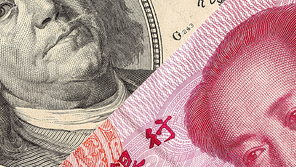 A weak US dollar is a blessing for China. 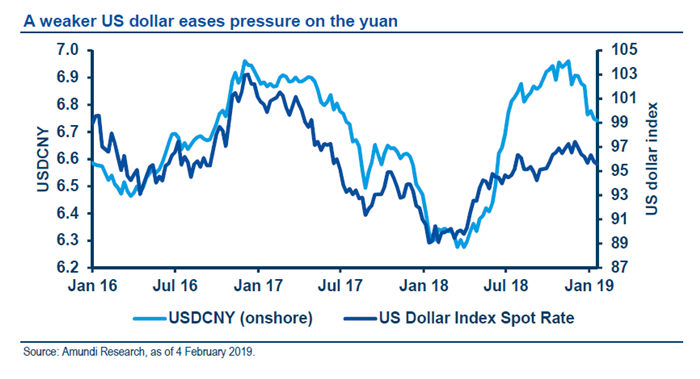 The Chinese yuan (CNY) has strengthened against a weaker dollar since the beginning of the year, moving away from the level of 7, perceived by the market as a dangerous threshold. This is very important, as China can implement easier monetary policy only when the US dollar is stable or tends to weaken; otherwise, there is a risk of too much pressure being put on the currency. If China and the US reach a partial deal in March, we could see currency appreciation and a positive reaction from the equity market. For now, we expect the yuan to move around current levels, with a target of CNY 6.7/USD 1 by end-2019. The current account dynamics points towards more balance into the medium term, but we don’t expect to see any sharp deterioration near term, especially considering low oil prices, the stable service deficits, and improved control of outflows through illegal channels. The non-oil surplus could trend down, but only gradually. 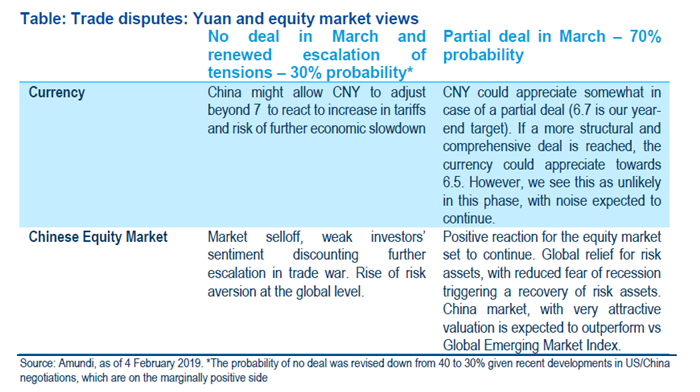 Based on different scenarios in trade negotiations, we could see different trends in the CNY and the equity market. If US/China talks go relatively smoothly, as we expect, the CNY could be allowed to appreciate somewhat; if the US and China were able to reach a more structural deal, the CNY could perhaps move towards around 6.5. While reaching a final, complete deal still looks to be a difficult proposition in the near term, a partial solution to the trade war would still be viewed positively by investors. Regarding selection, we prefer the most domesticdriven stocks. Among Chinese markets, we have a preference for the HSCEI (Hang Seng China Enterprises Index) which looks even cheaper than the MSCI China, thanks to its higher exposure to financials which were quite hard hit during the last year. Chinese banks are even more attractive, with regulators making new efforts to improve Chinese banks’ capital strength as domestic and external growth slows. China’s banks have recently been allowed to issue bank perpetual bonds, in which insurance institutions were allowed to invest, and central bank bills swaps look set up to improve their liquidity. We also are confident that the improving trade negotiation process will support domestic sentiment, giving a boost to southbound flows. In stock selection, we remain positive on the most domestic-oriented companies, such as internet companies, oil, pharma, consumer staples and property, although in a very selective manner for the last two. Telecom, utilities, auto still remains the least favourite sectors. In the medium term, the composition of the HSCEI will change due to the “Stock Connect”, adding exposure towards the “New Economy”. In terms of fundamentals, high return on equity (ROE) and high dividend yields could provide good value. If US growth moderates somewhat, with the Fed remaining relatively dovish, China will have more policy room to help its economy via monetary and fiscal easing, and this should be positive for a rebound of the market. The main risk in the short term comes from the ongoing weakness in the economic cycle. Our internal forecast for EPS growth for MSCI China for the next 12 months is still positive, but decelerating from the double-digit growth seen last year. The ongoing reporting season (still at its beginning) will be key to assessing how fast the deceleration will unfold. In conclusion, we expect the Chinese market performance to be highly influenced by the outlook for the US economy, the US dollar and trade negotiations. If US growth moderates somewhat, with the Fed remaining relatively dovish, as we expect, China will have more policy room to help its economy via monetary and fiscal easing, and this should be positive for a rebound of the market. Some challenges should be considered in the long term, which are linked to the extremely high level of debt in the economy and other structural issues. As for the deep structural reforms required, we are sceptical about any dramatic positive outcome in the short term, but more constructive on the medium to long term if China is able to continue to push structural reforms and openings, as we have already seen. This is crucial to making the economy even less dependent on external growth and more domestic-driven. "China’s economy appears to be more resilient than it was and the coming slowdown looks likely to be moderate."